As March 2014 drew to a close, it felt like Margot was in a good place. Margot’s bone marrow transplant appeared to have been successful and her appetite was starting to return. We were steadily working towards weaning Margot off TPN (Total Parental Nutrition) and also off the intravenous meds and onto oral ones, so that she could leave hospital and have her meds administered via her NG (Naso Gastric) tube & be cared by us at home. There was a quiet but growing excitement as each passing day edged us closer to this eventuality. Vicki & I were very aware of how, for Margot, arriving back home might seem daunting. We were advised to consider how the joy of Margot returning home and the excitement that would undoubtedly accompany her arrival from family who hadn’t seen her for several weeks might be overfacing. It would be a significant change and a breakaway from her current routine. And that could be unsettling and frightening for someone so young. 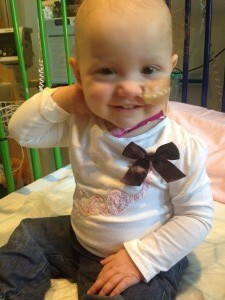 But first, we needed to manage the very first steps post isolation, whilst she was still in hospital. Like all toddlers, Margot was developing quickly however, her development was restricted, both in terms of the physical confines of the bedroom and also in terms of the people interactions she enjoyed. Margot had grown accustomed to living in a very controlled and routine hospital environment. It wasn’t permitted for her to receive visitors, but at the same time she wasn’t ever alone and had the comfort of being with at least one of the same (strictly three) carers from her family, plus the familiarity and regularity of seeing the same doctors, nurses & cleaners who visited at multiple times during a typical day. 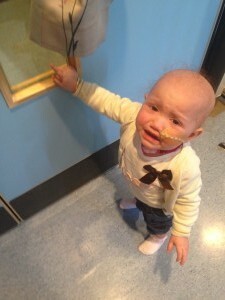 After Margot was declared “100% donor”, for the first time in weeks she was able to venture outside her bedroom for the first time. I remember holding the door open and encouraging Margot to leave her room and take a walk down ward corridor outside. Initially, she was a bit unsure and didn’t want to leave at all and then when she did, she was uncomfortable being away for very long during the first few outings, even though we only walked as far as the other side of the hospital ward. This behaviour was at odds with some of my own fears which often occupied my thoughts on arriving or leaving the hospital ward; for a long time I worried about how dreadful it might be if Margot decided that she wanted to leave the confines of her bedroom, but then became aware that she wasn’t allowed to do so. As Izabela’s shift ended and mine began, during the ‘swap’ Margot decided that she wanted to follow & go with Izabela as she left. All very upsetting at the time. Thankfully this was an isolated incident. Margot was a wonderful patient and throughout her treatment, she coped extraordinarily well, regardless of what was thrown at her. Doctors and nurses remarked upon this repeatedly and often and I don’t actually remember her complaining at any stage, in spite of all the unbelievably toxic chemotherapy and the awful symptoms that she had to contend with. So, whilst it wasn’t a huge surprise to anyone that Margot coped very well with this latest change of circumstance, I remember feeling a huge sense of relief nevertheless.